A serial entrepreneur, former actress, theatre playwright/director and screenwriter, Marcy ventured into the arena of personal development back in the 80’s launching a community called The Mastery which surprisingly is still going strong for over 37 years now. Over the past few years Marcy has been busily branding herself as a Nutritional chef and Integrative Wellness coach with Evolv health and her online blogs, webinars and cooking classes with” Make Healthy Taste Great.” She is working diligently in partnership with Evolv as a “Social Entrepreneur.” I am supercharged by my partnership with a company with a mission to eradicate childhood malnutrition through a “Buy 1 give 1 model ( similar to Tom’s Shoes). I’m humbled by this venture and see it’s a big enough cause to feed my overarching principle of helping others! In the past 3.5 years, almost 18 Million servings of whole food nutrition have been donated to malnourished and medically fragile children in Mexico, parts of the U.S and soon in Canada. Due to her own health challenges over five years ago Marcy began her own wellness journey and as a result of taking her own nutritional advice she has lost significant weight and healed from a myriad of health issues including arthritis, debilitating back pain, IBS, food sensitivities and chronic fatigue. Due to sharing these health benefits with others she has grown a successful business across North America and impacted hundreds of others on their health journey too. Marcy is also in the process of writing her first cookbook with a focus on preparing foods and menu plans that heal the body by lowering inflammation, reducing toxic load, stress and fatigue and most importantly supporting immune and gut health. 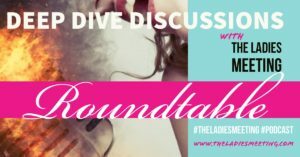 She has also hosted The Ladies Meeting Roundtable Podcast – 7 her series of 7 podcasts for us is focused on women’s health and getting hormones in balance. You can listen to her on Anchor.fm/ladiesmeeting and choose the platform of your choice from Itunes to Spotify and more.